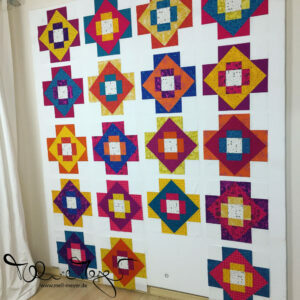 x and plus blocks for the third border are finished! 6. My finish for Q2. This quilt has been finished. Click here for the blogpost. 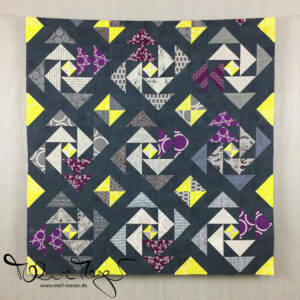 For motivational purposes I am adding the One-Year-Quilt Technocolorgalaxy (Skill Builder BOM) to the list. So now it’s up to six projects again. I am quite happy with my results for Q2. The regularity in my sewing is not really regularly but it’s getting more often. So let’s do it! Linking up at Finish Along 2015 @On the Windy Side. 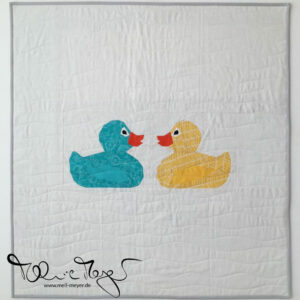 Well, it sounds like you just need to have a couple of quilt treffen meetings to knock out a couple of those blocks ; ) It just dawned on me – how about using some of those Disappearing Four Patch blocks and piecing them together for the backing for your From Outside Inn quilt… that would be two birds with one stone! I’m really glad that you pulled out the Drunkard’s patch quilt to work on… I really like the scrappy look and the colors are so nice on this one. Yeah for the finish! Very colorful projects! Can’t wait to see these finishes.